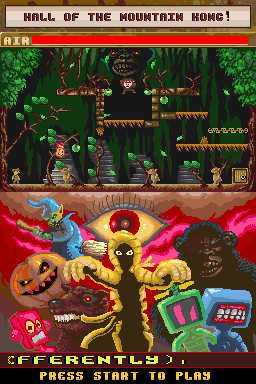 Flash, il quale ha partecipato al progetto che alla fine ha portato a Warhawk DS, rilascia la prima versione stabile del suo remake di un vecchio platform per ZX Spectrum chiamato Manic Miner portato come homebrew su DS sotto il nome di Manic Miner - The Lost Levels. Per una maggiore compatibilita' sono state rilasciate due versioni chiamate EFS e FAT: per maggiori dettagli date uno sguardo allo spoiler. We recommend the EFS version for most people. For people exeriencing problems with the EFS verison should try the FAT version. This game requires a dldi patch compatible card to play. 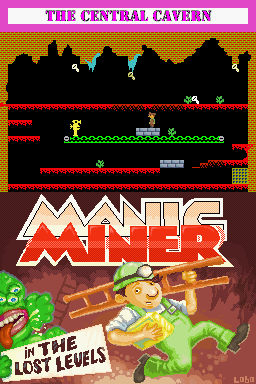 * EFS Version - Just copy the included ManicMinerLL.nds file to your backup card and play. * FAT Version - Copy the MMLL folder included in the archive to the root of your sd card. Copy the ManicMinerLL.nds to anywhere on your card. * DSTT Cards - There may be some problems with this card. We are not 100% sure why but this card doesn't seem to like .nds binaries that are larger than 2.7 MB. We may release a new version in the near future with all music loading from EFS/FAT to make a smaller and DSTT compatible binary. Sorry for the inconvenience! Trovate i due link per il download nella home del sito ufficiale!